If you can precisely identify the proper name and location of the statue above—or have a lead which you think might be useful—please send me an email, preferably including a URL which links to evidence supporting your identification. This same statue appears at center front of Northern Ireland B615 to B808. According to Diarmuid Curran, it's a generic vignette of Hibernia. Can anyone confirm or refute this assertion? Today’s challenge is to identify the following vignettes from Mozambique's banknotes. If you can precisely identify the proper name of any of the following—or have a lead which you think might be useful—please send me an email, preferably including a URL which links to evidence supporting your identification. The following scene appears on the front of Mozambique's 100-metical note (P126) dated 16 de JUNHO DE 1980. IDENTIFIED: Five FRELIMO soldiers raising flag on 25 June 1975 at Machava stadium in Lourenço Marques (Maputo). The following two scenes appear on the front of Mozambique's 500-metical note (P127) dated 16 de JUNHO DE 1980, so they may be related. The bottom scene could be a crowd waving their voter ID cards. However, I don't like to publish guesses in The Banknote Book, so if anyone can properly identify this vignette, please do. IDENTIFIED: Permanent Commission seated behind Samora Moisés Machel addressing People's Assembly. The following scene appears on the front of Mozambique's 1,000-metical note (P128) dated 16 de JUNHO DE 1980. On the wall is inscribed FRELIMO [Frente de Libertação de Moçambique] PARTIDO DE VANGUARDA DA REVOLUÇÃO SOCIALISTA, so it appears to be a monument or memorial to liberation fighters, but I've been unable to find its official name or location. IDENTIFIED: FRELIMO monument in Maputo in a small crescent-shaped square along Avenida Samora Machel, beside the old colonial Governor’s house (so called Casa de Ferro) and before the entrance gate of the Tunduru Botanic Gardens. At some point, the monument was replaced by a statue of the FRELIMO leader Samora Moises Machel, killed in a plane crash on 19 October 1986. Courtesy of Rocco Di Leone. The following scene appears on the front of Mozambique's 5,000-metical note (P133) dated 3 de FEVEREIRO DE 1988 and the 500-metical note (P134) dated 16 de JUNHO DE 1991. Is the statue/carving a famous one? If so, by whom, and what is the name? IDENTIFIED: Wood sculpture by Alberto Mabungulane Chissano. Courtesy of Thomas Augustsson. The following scene appears on the front of Mozambique's 20,000-metical note (P140) dated 16 DE JUNHO DE 1999. IDENTIFIED: Allegorical representation of education. Coutesy of Frank van Tiel. The following appears on the back of Mozambique's 50,000-metical note (P138) dated 16 DE JUNHO DE 1993. Is this just decorative artwork, or does it have some other significance? IDENTIFIED: Portion of ceramic low relief on the front of the bank headquarters by artist Querubim Lapa de Almeid. Courtesy of Rocco Di Leone. It's been a while since I last posted a challenge, but I'm working on the Mozambique chapter of The Banknote Book and I came across the following unidentified items on the banknotes dated 1975. All four of these circular items appear at right front on these notes. Does anyone know what they are, or what they are supposed to symbolize? If you can precisely identify the name of these items—or have a lead which you think might be useful—please post a comment, preferably including a URL which links to evidence supporting your identification. Also, according to the SCWPM, these notes (Pick 120-124) were unadopted designs, but I have a scan of a well-worn 100-metical note with normal serial numbers, indicating actual circulation. So, were they issued, and if so, when, and for how long? Today’s challenge is to identify the objects which appears on the back of the old 5,000-franc note of Madagascar. If you can precisely identify the name and location of the building and/or monument—or have a lead which you think might be useful—please post a comment, preferably including a URL which links to evidence supporting your identification. These objects appear on the back of the 5,000-franc from 1983 (Pick 69). The SCWPM claims the building is a school, but doesn’t give a precise identification. The monument has writing on it which reads “MADAGASIKARA MAHALEOTENA NAMBARA AMBAHBENASO 26 JUIN 1960.” The date is Madagascar’s independence day, and the text is in Malagasy. IDENTIFIED: La Bibliothèque Nationale de Madagascar (The National Library of Madagascar) building in Antananarivo and Stèle de l’Indépendance in Place de l’Indépendance in Antananarivo. Courtesy of Robert Bethea, Murray Hanewich, and Dominique Dannery. Today’s challenge is to identify the building which appears on the back of the old 20-kip note of Laos. If you can precisely identify the name and location of this building—or have a lead which you think might be useful—please post a comment, preferably including a URL which links to evidence supporting your identification. IDENTIFIED: Wat Sop monastery in Luang Prabang. Today’s challenge is to identify the gate which appear on the front of the old 100-won notes of South Korea. If you can precisely identify the name and location of this gate—or have a lead which you think might be useful—please post a comment, preferably including a URL which links to evidence supporting your identification. IDENTIFIED: Gwanghwamun gate to Gyeongbokgung palace in Seoul. Today’s challenge is to identify the items which appear on the back of the old 5-dinar notes of Jordan. IDENTIFIED: Monastery tomb urn on top of Ed-Deir Monastery in Petra. See also this photo. Courtesy of Tristan Williams and Alessio Amato. 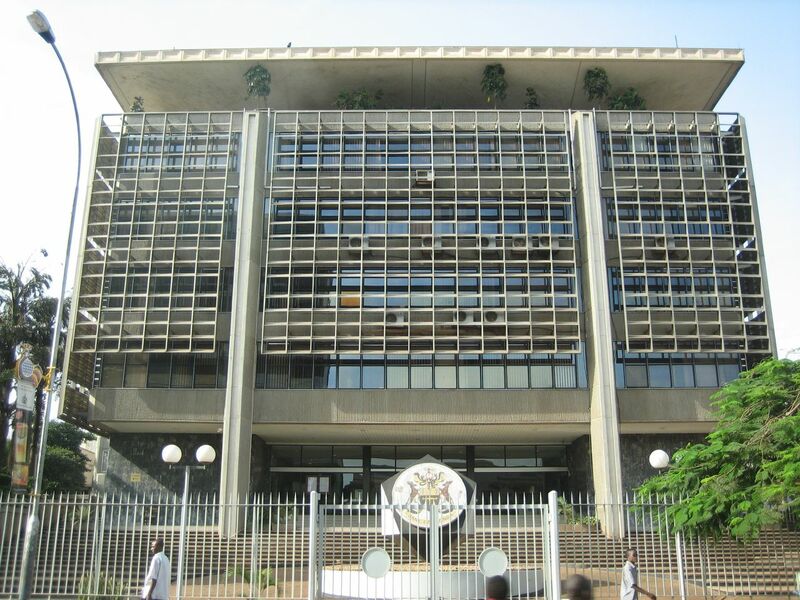 Today’s challenge is to identify the building which appears on the back of the old 20,000-cedi note of Ghana. IDENTIFIED: National Theatre of Ghana in Accra. Today’s challenge is to identify the crossed objects which appear in the seal of the Central Bank of Liberia (and previously the National Bank of Liberia). If you can precisely identify the name of these objects—or have a lead which you think might be useful—please post a comment, preferably including a URL which links to evidence supporting your identification. Today’s challenge is to identify the following items from Mali’s banknotes. IDENTIFIED: Le Marché Rose (pink market) building in Bamako. IDENTIFIED: Markala dam on the Niger River. IDENTIFIED: Sotuba dam hydropower plant on the Niger River. Can someone please identify the building on the back of Pick 24? Given the diploma and students in the vignette, it’s almost certainly a university, but which one? Educated guesses are welcome, but I am looking for definitive answers supported by citations if possible. IDENTIFIED: Kabarnet Boys High School administration building in Baringo County. Can anyone positively identify the following items that appear on some Sudanese banknotes? Precise names and locations of the buildings are appreciated, and links to supporting evidence is welcome, too. 1. The secretary bird at the center of this vignette appears on the front of B312 - B321. It is not the coat of arms of the country. Perhaps it is the logo of the bank? 2. Identified: Parliament House in Omdurman. 3. This building appears on the back of B342 - B344. Identified by Pavel Gusev: Ministry of Information and Communications in Khartoum.